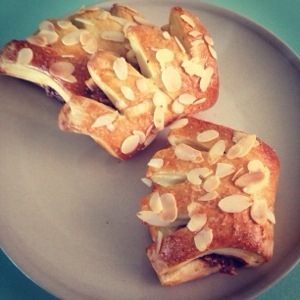 The Pseudo Artisan Baker : Nutella Bear Claws | Eating Aloud! Disclaimer : This is not an “authentic” Bear Claw. The dough I used was not puff pastry. And the filling was not almond paste. As long as I shaped it like a Bear Claw, who cares. One day, I will make Bear Claws properly (puff pastry, albeit frozen). Now I’m just a little intimidate by it so I guess a basic bread dough will do. And who doesn’t love Nutella? -hazrock, Nutella is a food group.